Some people know that they’re called to nursing careers from childhood. Anne Brown took a little longer to figure that out – and UNCG has been with her for every step of her journey since then. 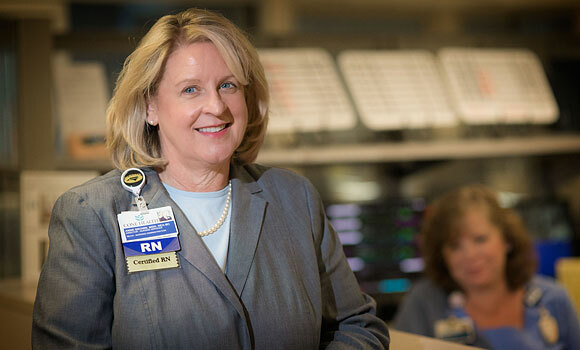 Well before she ascended to her current role as director of nursing and patient services at Cone Health’s Wesley Long Hospital in Greensboro, Brown was an English major from the University of Georgia who had forged a successful career in the travel industry. Still, she’d always had an interest in biology, and then a health crisis gave her a close-up view of the medical field. While Brown was hospitalized extensively during a complicated pregnancy, she came to admire the work of the nurses who aided her every day. “I remember thinking, ‘Gosh, I think I can do that!’” Brown recalls. When her husband’s work led them to Greensboro, she decided to take the leap. At the age of 41, while raising two small children, she earned her Bachelor of Science in Nursing degree. Within three years, she already held a leadership role, serving as assistant director of the medical intensive care unit for Cone Health, then known as Moses Cone Health System. It wasn’t long before Brown was back at UNCG again, this time to earn the Master of Science in Nursing degree she needed to obtain a director-level position with Cone Health. Another outstanding experience positioned her to become department director for the surgical intensive care unit, a role she held for five years. This fall, Brown is back for even more at UNCG – as a member of the first class of the School of Nursing’s new doctorate of nursing practice (DNP) program. This time, it’s the vastly complex and rapidly changing climate of health care – with government regulations, insurance companies and consumer expectations all evolving – that’s compelling Brown to upgrade her knowledge. How else can she take full responsibility for the 400 employees and $40 million budget she oversees in her current role?